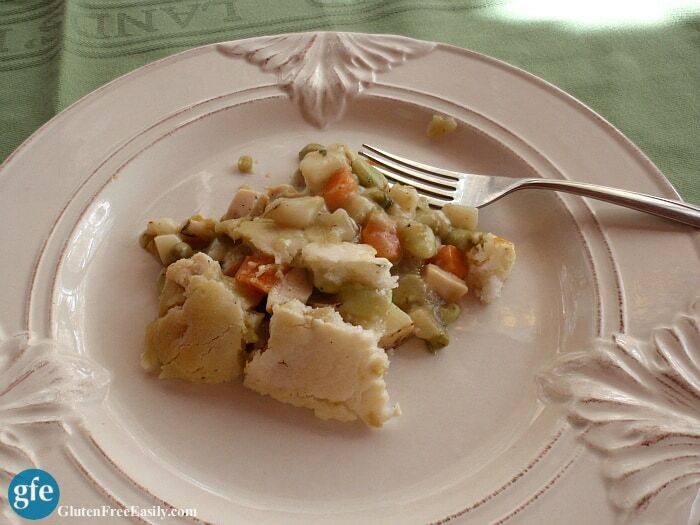 I’m so very happy with this gluten-free Pot Pie that I’m sharing with you today! It’s the ultimate comfort food dish and the best pot pie I’ve ever had in my life. Gluten free or gluten full. Let me tell you how this recipe came to be. However, some gfe readers had thought the same thing about the possible pot pie idea and emailed me to ask if I had a simple conversion recipe. I say “conversion recipe,” because the batter poured over the apple pie calls for a cup of sugar—which would definitely not be a good choice for a pot pie batter. When Jessica asked me the same question in a lovely email she sent the other day, I decided the timing was right to seriously address this question/need. I had plenty of turkey left over from my slow-cooked turkey recipes—Traditional Turkey Breast and Special Turkey Breast. So I looked online for some simple ideas that might inspire me further. There were many pot pies topped with standard, “roll-out” pie crusts, even gluten-free versions, and many of them did look wonderful. But, they weren’t what I wanted. Do I need to mention it was right after Thanksgiving? Not only was I looking for an easy topping, but I also didn’t want too much “heaviness” or mega calories. Other recipes called for a biscuit-type topping, which I wasn’t interested in either. 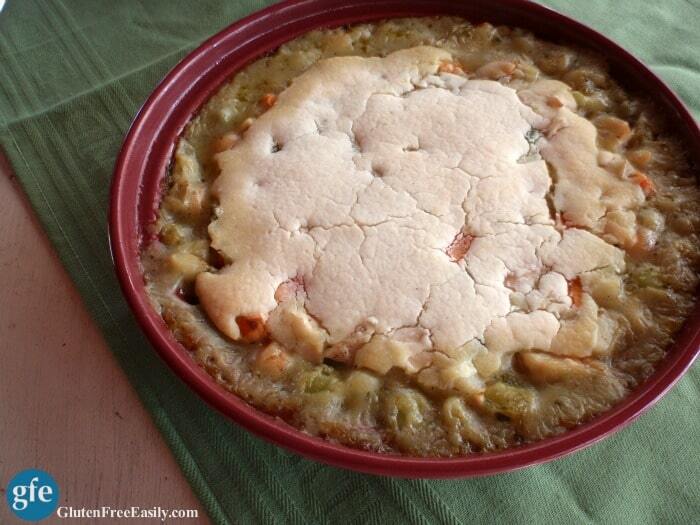 Finally, I found a promising turkey pot pie recipe (with a “pour-over” crust) at the Gluten-Free-Diet-Help site. First, I halved the recipe (we certainly didn’t need a 9 x 13 pan full of pot pie for just the two of us). Second, I decreased some ingredients, cut some ingredients, increased others, and streamlined the recipe. In the end, I was really pleased with the results and Mr. GFE gave his hearty approval, too. I may tweak the recipe for the crust topping if I make it again (and update the recipe here) because it was pretty thin (and looked somewhat like a cracked desert as you’ll see). I may decide that I’d like to try a more traditional crust as far as thickness next time. However, the filling was thick and luscious, so a light crust (again, given that it was immediately after Thanksgiving) seemed just right. I used canned full-fat coconut milk in this recipe. That addition did not make the pot pie have a coconut taste, but it did provide a slightly discernible, yet pleasant sweetness. Note that the recipe I took inspiration from actually called for some sugar, but that was one of the things I omitted. The herbs and seasonings (parsley, thyme, oregano, sea salt, and peppercorn medley) used also ensured that the pot pie did not come out sweet, but rather was the very definition of savory in my opinion. Last, here’s the funny thing … I got so caught up in how beautiful the vegetables looked and how nicely the whole mixture thickened, that I completely forgot to add the turkey! Cooking accidents can often yield some wonderful results—in this case, a lovely vegan and gluten-free pot pie if one uses vegetable broth in the recipe. Because we wanted to use up our leftover turkey, I just diced some turkey on each of our plates and served the pot pie over it. Reader review: "I can’t even begin to tell you how much my entire family and I LOVED this recipe! Completely and totally amazing and better than any (including "gluten full") pot pie I have ever eaten!" 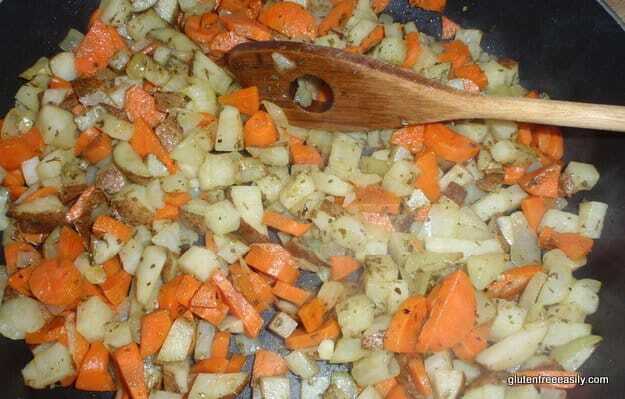 In large, deep skillet or Dutch oven, heat 3 tablespoons oil and add the onions, carrots, potatoes, parsley, thyme, oregano, sea salt, and pepper. Allow to cook on medium-low or medium heat until vegetables are softened. Add chicken broth and bring to a boil. 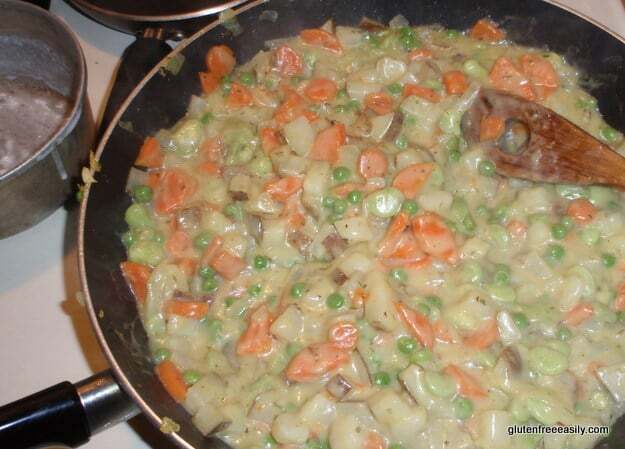 Allow it to simmer about 2 minutes, then add peas and lima beans and cook until tender. Preheat oven to 375 degrees F. Meanwhile, in a saucepan, mix the 1/3 cup flour and 2 tbsp oil until blended, and heat on medium-low a minute or two until thickened. Add the milk gradually to make a white sauce. 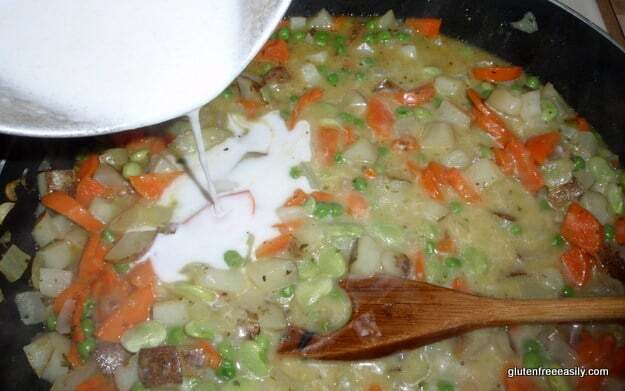 When the mixture is almost thickened, add to the vegetable mixture. Stir in chicken or turkey, if desired. When all is thickened nicely, pour into a medium-sized greased casserole dish or deep dish pie plate. In same saucepan, whisk together crust ingredients: flour, salt, baking powder, and milk. Pour over top of filling in casserole dish or pie plate. Even out the topping with a spatula, not quite going to the edge of the dish (leaving this space allows venting, if needed). Place pot pie into preheated oven and bake for 30 – 45 minutes, until crust is lightly browned. Originally published December 1, 2009; updated August 20, 2018. This looks great Shirley! I love the idea and ease of this. For me, pot pie will always mean biscuits on top, but this isn’t too far off =D. Hi Lauren–Thanks! It’s a dish I’ll be making again and again … it was really very good. I love that you mentioned the ease of this recipe. I was reluctant to tag it as easy because of peeling, cutting, and several steps, but it is easy. I loved that when I added the coconut milk mixture to the vegetable mixture, it instantly thickened to just the right consistency. I love it with and without the turkey. So you make biscuits just to use for pot pie? Yeah! We make biscuits, put the raw dough on top of the hot mixture, and cook in the oven according to the biscuit recipe. Its not as simple as this, but doesn’t take much more time or effort! Then we cook the extra biscuits on a sheet at the same time! You guys are a cooking & baking family—I love that! Great and sensible idea on cooking extras at the same time. 🙂 I know your biscuit-topped version is great, too. So, it’s good to know that the effort doesn’t take much longer. 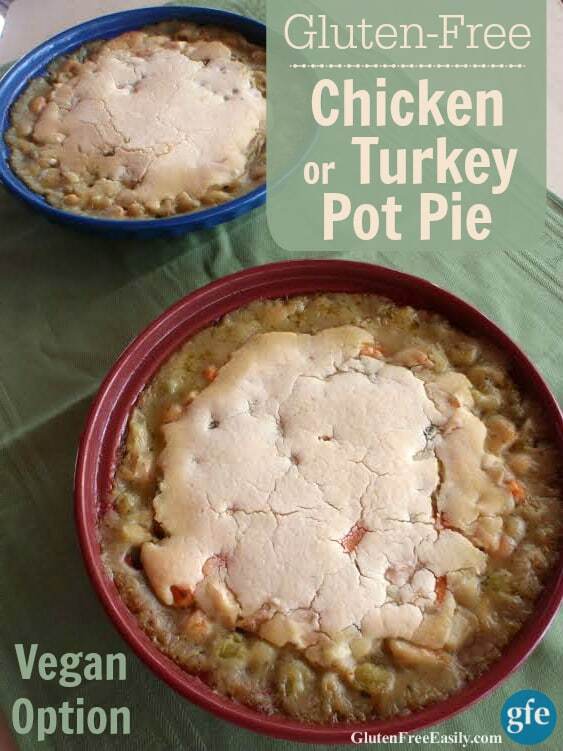 Great recipe Shirley…we luv pot pie…yum!! This recipe sounds great! I do intend to make it. I ABSOLUTELY LOVE that you left out the turkey, by mistake, and then just served it on the side! (And by the same token, know that it is equally good without any meat and therefore good for a vegetarian.!) My husband also finds the positive in any situation… could this be a trait of those on a gluten free diet? Hi Kay–Well, in fact, I was a lot more negative and moodier when I was eating gluten. Gluten affects the brain. Depression and mental illnesses have been tied to gluten issues from sensitivity to celiac. You can read this article about depression and gluten by Dr. Vikki Petersen, the author of The Gluten Effect, if you are interested. I actually laughed out loud when I realized I’d left out the turkey. I was seriously smitten with the vegetable concoction. I’d already placed it in the pie plate and could have remixed it with the turkey and placed it in a larger casserole dish, but I just went with it. 😉 I will make it again this way … as a side dish (or with meat as its side), or for a vegetarian or vegan friend. I’ve discovered some great recipes that way in the past (like my vegetarian chili–which beats my regular chili any day). I love mistakes that turn out to be wonderful new recipes!! This sounds so yummy Shirley. Love how creative you got with the crustless idea. You bet your bottom it’s going on next weeks meal plan for my husband. He misses those aussie meat pies dearly since our household is GF! Hi, Em!–It’s so good to see you here again. 🙂 Oh yes, please make a version for your hubby … I think he’ll enjoy it. Being gf doesn’t mean giving up all those special dishes, it just means going a different route. 😉 I definitely prefer the easy, crustless route! All I have to say is, I cannot, cannot, cannnnnnnnot wait to make this! Well done!!! Your recipes never cease to amaze me. This looks like a wonderful dinner! Forgive all the exclamation points, I’m just very happy to find this recipe!! This looks so good, and I haven’t made pot pie in years! YAY!! I’ve been patiently waiting for this recipe! Never used the coconut milk before, but I think I’m gonna try! This will be our dinner Sunday night!!! Hi Lisa–I’m so happy you checked back and saw this recipe! I can’t wait to see what you think, especially using coconut milk. 🙂 You might not want to mention the coconut milk until after family members say they like it. 😉 You might also want to double the crust recipe if you want a thicker crust, but I really liked it a bit thinner because the filling is so thick and creamy. Enjoy and thanks so much for stopping by and commenting! My husband loves a good pot pie. I baked mine with biscuits on top and he went ga-ga for it. I like the versatility with this recipe – vegan or with turkey. I think it helps people to start thinking about how they can take any dish and, with a little creativity, morph it to fit their needs. Amy–LOL on the “ga-ga” … sometimes the “ga-ga” is quite unexpected, don’t you think? Thanks for your perspective on morphing recipes. That’s part of what gfe is all about … working with what you have, not making gf too hard, etc. 🙂 So, thank you for offering that! Of course, I love Slightly Indulgent (on any day)! I really need a go to gf flour mix too. I’m guessing I could swap out sorghum flour for the rice flour and just keep that handy. Then I could have a pot pie more often. Thank you for sharing this on Friday Foodie Fix. Diane–You could try that, but even mixes that contain sorghum usually also have other ingredients like potato starch and potato flour. I just found this recipe online for a gf flour mix from Carol Fenster. Not sure if you have issues with the other ingredients. You can either add xanthan gum when you make the mix or add it when you do your baking … about 1/2 tsp per cup of flour mix. Hope that helps. Of course, I haven’t used this flour mix, but Carol Fenster is pretty well thought of for her baking. OMG, I made the vegan version of this last night and my entire family INHALED it! I think that next time I will double the crust recipe so as to not repeat the fight over who gets the last section of crust when the dish was empty. Checked out your blog, Green V-Neck, quickly … will go leave a comment. You have a A LOT going on. 🙂 Love your granny square afghan. It’s been many, many years since I’ve made one of those. Wonderful that you do that as a way of bonding with your hubby! Thanks- Looks good, im going to give it a shot! Hi KW–Welcome to gfe! 🙂 We find this pot pie to be one of our favorites. After sharing the link again in my Thanksgiving Favorites post, I think I’ll be making this recipe again this weekend using chicken. Can’t wait! I hope you’ll report back when you make it. 🙂 Thanks so much for taking the time to comment! I’m back already! Loved this recipe too! I just used a bag of frozen organic mixed veggies and it worked great, except my crust wouldn’t brown. Stupid gluten free flour. This went with me to a Christmas party – dish to pass. There were only 11 of us at the party – and this came home almost empty. The guys had seconds – and they gave complements all around – even my husband gave this a 5/5. I made this pretty much as given except I used canned peas, and omitted the limas, and meat. I split a can of coconut milk between the filling and the crust. The crust didn’t brown after 45 minutes – so that’s the way everyone ate it – and they loved it. Because I used potato flour, it tasted like Shepherd’s Pie… Next time, I may try the bisquits or mashed potatoes for a crust. This one is a keeper. Hi Debbie–It looks like you are new to commenting here at gfe–welcome! 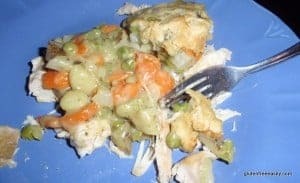 🙂 I’m thrilled you had such success with this pot pie and very thankful that you took the time to let my gfe readers know how good this pot pie is. As you’ve shared, you can pretty much use any cooked veggies and it’s great with meat or vegan. I think it’s the amount of coconut milk that keeps the crust from browning as I have no problem with gf cookies, cakes, etc. browning. I made this recipe again recently and Mr. GFE and I were so happy to remember how good it is, but even leaving it in the oven longer, it browned some, but cracked and looked funny. Yep, like you, next tiime, I’m trying a slightly different crust (maybe the garlic cheese biscuit mix made dairy free with Daiya and another dairy-free milk … a reader has already shared her success with the biscuits made that way). I’ll share the new version if it works. I like your potato flour factor and certainly mashed potatoes as a topping would make this pot pie divine! Awww, so it’s the coconut milk causing it to stay so strangely white? Hi Debi–Oh, how I loved reading this review. 🙂 OMG indeed. That is too funny. I guess your hubby is no longer worried about you marrying me … now he’s just enjoying all my recipes! LOL Give Mr. HL an appreciative hug for me. 😉 Thank YOU so much for making the pot pie and reporting back, Debi! We made this for Christmas dinner and it was FANTASTIC! I’m thinking of making it for a potluck but would probably need to prepare the ingredients the day before and just pop it in the oven before the pot luck. Do you think it will dry out in the fridge? That’s great advice, thank you Shirley! I’ll definitely try it out! Just found your recipe and tried it this evening–it was amazing! I’ve not had pot pie of any kind since being diagnosed as wheat/gluten allergic almost 10 years ago! I am currently an expat in the Czech Republic (married to a Czech), and have a difficult time finding wheat- and gluten-free flours here. However, rice flour’s very easy to get. I used only rice flour for the crust and thickening and it tasted great! Czechs love garlic, so I added some to the dish, too. Otherwise I followed your recipe exactly. This is truly a comfort food I’ve been so hungry for and your recipe fit the bill quite nicely! Thanks so much for sharing! One more note, this was my Czech husband’s first experience with pot pie, and he loved it! Hi Sher–Welcome to gfe! 🙂 What a wonderful review—thank you! I’m so happy you and your husband loved this recipe. I have to admit that every time I make it, Mr. GFE and I are newly surprised at how much we enjoy it. 😉 Great idea on adding more garlic to make your Czech hubby happy! That would make me happy, too. Got this in the oven again! YUM! I never leave comment for anyone (I usually just forget), but I made this last night and it was AMAZING!!! This will for sure become a regular part of our dinner plans. Thanks for the recipe! Thanks for all of your work Shirley. This looks really good. I am just starting my GF path and have to admit I am struggling. I’ve tried several bread recipes and have been disappointed with the results. I’ve also tried a GF tuna casserole recipe and it was rather gross. I am going to try this one next week. Wish me luck! Oh Shirley I can’t even begin to tell you how much my entire family and I LOVED this recipe! Completely and totally amazing and better than any (including glutened) pot pie I have ever eaten! I doubled the recipe which filled a 9×13 to the top. I am dairy free and not a coconut milk fan, neither is my family but the only other non-dairy milk I had was a really gross organic soy I was trying and I didn’t want my filling to taste like that so very reluctantly I used the can of coconut milk. I used potato flour and homemade turkey stock in my filling and for my topping I used Artisanal Gluten Free Flour blend from Kelly and Peter Bronski’s cookbook. My topping was not “pourable” I just dropped spoonful’s of it on the top. Baked for 45 minutes and it was perfect. Three bites in my husband said Wow, this is good, my daughter…this is fantastic, my 3 year old tried to repeat fantastic. Everyone cleaned their plate; my husband had 2 helpings but over the next 10 minutes kept putting his spoon back into the pan and taking more so in actuality he had at least 3 servings. I had 2! I really think the coconut milk is the “secret ingredient” in this recipe. When I asked my husband to guess what the sauce was he could not believe it when I told him it was coconut milk. I have already frozen turkey and turkey stock in these quantities to be able to make this 2 more times. WOW is all I can say. Now off to warm up my lunch that I have been drooling about since I woke up. Hi Shirley! I was so excited to finally find this site and such great recipes. I have been gluten free for almost a year and it has actually been easier than I thought it was going to be- but that may be because I’m a busy student who isn’t eating out very much anymore! 😉 I am eager to try your flour blend. I’m going to my local Asian market today and would prefer to buy the same brand as you. Could you please let me know which brands you use? Thank you so much and happy holidays! Kristin–Sorry for the delay in replying. I’m inundated with comments for the giveaway and some are getting lost momentarily. 😉 When I read your comment, I wanted to do the happy dance!! I even read it to my husband. He loves this recipe, too. 🙂 I agree that coconut milk really makes this pot pie special! And I absolutely love that you’ve planned for two more pies! Thanks so much for sharing, dear! if I was taking this to a potluck, would it be ok to make it ahead of time and just reheat when time for dinner- and if so, how long and at what temperature would you reheat? 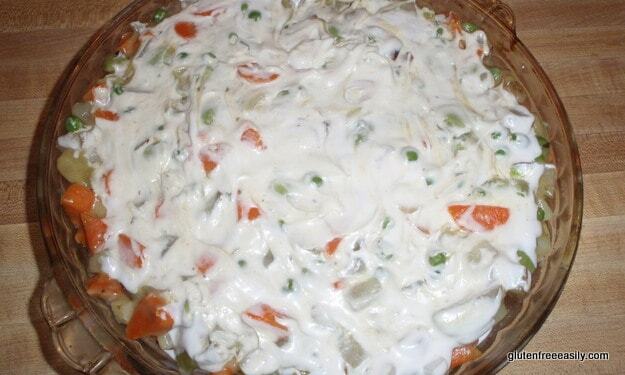 Hi robin–This tastes even better the second time around, so I don’t think you could go wrong taking it to a potluck. (Other readers have mentioned taking it to a potluck, in fact.) I’d probably reheat it at 350 degrees for 20 to 30 minutes. You’ll be able to tell by the edges when it’s done I think. If I got impatient, I’d probably crank the temp up to 400 degrees for a shorter reheating time perhaps. I’m like that sometimes. 😉 Basically, you’d follow the same reheating instructions you’d do on any casserole dish. You’re lucky you caught me online! LOL Best of luck … let us know how it goes! Shirley I can’t believe how delicious this pot pie is! I am always on the look out for recipes using up chicken. In the winter I make a lot of chicken stock using inexpensive thighs and legs and always have a lot of leftover soup chicken and it works perfect in this recipe (it’s gets to a point where there’s only so much chicken salad you can eat!). The filing is so rich and creamy and I add a little sorghum to the crust to darken up the color and it is so good! And the leftovers freeze well in single serve Tupperware containers. That way when my family decides to order pizza, I still have a healthy safe meal I can heat up in minutes. Thank you!! made this tonight, the bottom part turned out great but the crust wouldn’t cook through.. it was all gummy no matter how long I cooked it. I’m sure I did something wrong, maybe overmixed it? so I’m just eating the bottom part. I do want to try making it again. Hi Laura–First, welcome to gfe. 🙂 I’m so glad you enjoyed the filling part, but so sorry the crust didn’t cook through for you. I have some thoughts, but first let me ask what ingredients did you use the make the crust topping? Hi Shirley, I used your crust recipe tonight but I didn’t have enough milk so I used about 1/3 cup vegan cream cheese, 1/3 cup of dairy-free milk, and 1/3 cup of water and it turned out great! Sharing in case anyone else is stuck without enough milk. As always, thanks for sharing your recipes with us. This was amazing. My whole family LOVED it. Thank you! Hi Stephanie–First, welcome to gfe! Second, you have totally, totally made my day! I’m so very, very happy that you and your family loved my pot pie recipe! It’s one of our favorites, too, and perfect for this time of year. Thanks so very much for taking the time to leave this review. I really appreciate it! Hope you’ll find many more recipes that you love here on gfe!